The Bhagavad-gita itself presents both viewpoints before reconciling them. 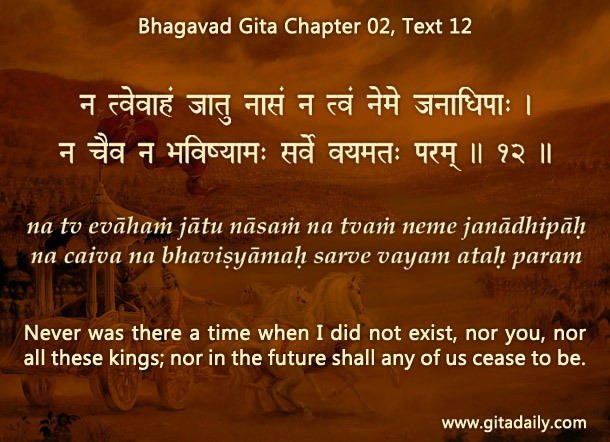 First, the Gita (02.12) puts the eternality of all souls and Krishna on an equal footing. But then it (10.08) extols as wise those who understand Krishna to be the source of everything. Later, it (15.07) reconciles by informing that all souls are eternally the parts of Krishna – parts who suffer when they pretend to be wholes under the spell of the mind. This verse points to the sense in which Krishna is our source: not chronological, but ontological; not in the sequence of origination, but in the status of subordination. Time, as we understand it here in the material world, doesn’t exist in the spiritual world – that world is eternal with no creation or destruction of things of the kind that happens here. So Krishna is not our source in the sense that he existed first and then created us. But the absence of creation in the spiritual world doesn’t mean that things exist in a perpetually frozen state of stasis. No, there’s exciting and fulfilling dynamism in our loving interplay with Krishna. To give us a glimpse of the relationship that underlies this dynamism, the scriptures refer metaphorically to him as our source. This usage is meant to remind us of our role as his parts and to thereby join his ecstatic love-play. Additionally, in material existence, Krishna is our source literally too. The Gita (14.04) indicates that he is the seed-giving father, injecting souls into the womb of material nature, wherein all living beings manifest. By thus carefully understanding our relationship with Krishna, we can gradually relish life eternal.